Will the Federal Reserve leave in or take out the word “patient” at this Wednesday’s FOMC Meeting? The Federal Reserve Open Market Committee’s Meeting takes place this coming Wednesday, March 18th. The question in front of the Fed is whether or not to remove the word “patient” which would imply a move to begin normalizing interest rates will take place this summer. Gold is impacted by the value of the US Dollar and competing returns on investments. Gold is priced in US Dollars, which means the value of the Dollar impacts the price of gold. The currency war I have been writing about for a couple of years went into full swing this week when the European Central Bank embarked on buying EUR60 billion per month going forward until September 2016. Unless you don’t read, you know that the Eurocurrency is in a free fall, possibly headed down to parity or lower versus the US Dollar. At the same time, other countries who are not Eurozone members are now enacting programs to lower the value of their currencies in a race to keep up with each other and not give up export business due to a strong relative currency value. At the end of 2014 I wrote a Gold Report predicting lower gold prices. I broke down my reasons which I’ve again posted below. In that report I mentioned that I expected the next catalyst necessary to move gold higher is inflation, which is clearly not at work in most developed countries. Missing that component, gold continues to work lower. India‘s population, a major buyer of world gold, is seeing inflation. It’s running near 6.5%. However, with the import duty left on gold purchases from abroad, gold demand remains held back. Let’s take a look at how inflation is now running in the rest of the world’s major economies. Brazil and Venezuela are seeing runaway inflation, but the reasons for that are currency related, not commodity related. What’s clear is that at this time none of the above countries are meeting their self-imposed inflation targets of 2%. In December of last year I listed the following reasons why I thought inflation would be held back. Here they are again. “Rising Dollar Impact: The impact of a rising Dollar should exert a bearish influence on gold because gold is priced in Dollars. The higher the Dollar goes, the more negative impact seen on gold. Whether or not the Fed raises interest rates anytime soon, the Dollar gets a bid because our economy is improving as other competing economies are shrinking. If there are any surprises in store for interest rates, it will center on when the European Central Bank lowers interest rates and when the US raises them. This is Dollar positive. Falling Oil Prices: The surprise of the year has to be the speed and magnitude of the drop in crude oil prices. Lower energy prices offer a “tax” break to consumers while it robs income to producer countries. The break in large part is due to the USA becoming in but 5-years as large an oil producer as Saudi Arabia. This change means the US does not import as much foreign oil as it once did, which makes that oil available to others who don’t need it due to their economic slowdowns. Because producers need the income, producers haven’t cut back enough on production to cause prices to rally. Therefore, this is a deflationary event that is not bullish gold, although any “surprise announcement” by OPEC members, including Russia or Mexico could put a floor in oil and would be positive gold prices. For the time being, production is not being cut. Chinese Demand: China is the number two consumer of gold. Price break in gold will likely see China and the number one consumer, India, support gold on price breaks. It does not appear that India is likely to change its policy of imposing gold duties even though the government there had been discussing do so in late 2014. Foreign Debt: Russia is witnessing either a planned event by the Saudi’s and US to economically cripple Russia or Russia is simply running into headwinds of its own choosing. If Crude Oil prices don’t rally from the $60 a barrel area, Russia will find itself looking at a decline of 4% in its 2015 GDP according to the Russian government. Venezuela will likely declare itself bankrupt if prices stay at $60 or lower. If Russia sells gold in place of currency reserves to support the ruble, that supply coming to market might be considered bearish. I think you’d agree that little has changed since I wrote the above. There’s a much more obvious relationship at work in gold than the value of the US Dollar and how its rise is influencing lower gold prices. The relationship is that of the direction of the US 10-Year Treasury note Futures to that of Gold prices. Keep in mind that US Treasury Futures are an inversion market, which means that when futures prices break, real interest rates are going higher and vice versa. As you can see below, starting in August of 2014, these two markets started to mirror each other to the point where you can almost use one as a proxy for the other. This has not always been the case, but when you see something as obvious as this you pay attention to it. This relationship came into play in August of 2014 and remains in place today. I will be extremely interested in how this plays out once and when the Fed decides to raise interest rates. If the Fed takes out the word “patient” next Wednesday, I will be looking to see how this relationship holds up. I’m using June 10-Year Notes overlaid on April Gold on the above chart. It seems very clear that up until August 2014, that when interest rate futures contract prices rose, gold prices broke and when the 10-Year Note Futures broke, gold prices rose. In August of 2014 that relationship shifted. Now one is almost a proxy for what the other will do. Whether or not this will last once the US begins raising interest rates remains to be seen, but I think it will in the immediate future. A mentioned above, a major test of the relationship might come as early as next week if the Fed removes the word “patient” from the FOMC Announcement. By Fed Chairwoman Yellen’s own definition removal of that word means a rate hike is imminent, likely to be enacted by June. Keep in mind that whenever the Fed makes a major policy shift, it’s likely to occur when a scheduled Press Conference follows the FOMC Meeting. That takes place 4 times a year. It’s in those conferences that the Fed Chair gets a chance to answer questions and explain the reasons for the Fed’s actions. · March 17-18 -- Meeting, Press Conference. · April 28-29 -- Meeting. · June 16-17 -- Meeting, Press Conference. · July 28-29 -- Meeting. · September 16-17 -- Meeting, Press Conference. · October 27-28 -- Meeting. · December 15-16 -- Meeting, Press Conference. The Weekly Chart trend is down-up. The current trend pattern is one of a lower lows and lower highs. I’ve marked the lower highs with red triangles arrows for you to see them on the above chart. Prices are trading under the 18-Week Moving Average of Closes which is under the 100-Week Moving Average of Closes. Therefore, the moving averages along with prices being under both of these averages are in a bearish pattern. The next downside target is the lower Bollinger Band, which comes in at 1135.5. Keep in mind that the Bollinger Band is an algorithm designed to keep the market trading within the bands 95% of the time. Momentum as measured by the Slow Study is in oversold territory as I consider a reading of under 30 by any one of the two bands that make up the study to be oversold. That can and does change if the readings of both get under 20 for several consecutive weeks, but that’s not the case here. Therefore, this chart is bearish, oversold and has 1135.5 in its sight as the next downside target. Resistance is up at the 18-Week Moving Average of Closes, currently 1211.4. The Swingline Study on the Daily Chart is in a downtrend as it has a pattern of lower highs and lower lows. Prices are trading under the 18-Day Moving Average of Closes, which is bearish as well. The dashed lines on the chart represent the Bollinger Bands. Bollinger Bands are an algorithm designed to keep prices trading between the upper and lower bands, 95% of the time. When prices first hit the band, I teach that that is where the “smart money traders” takes off part of their short positions, assuming they were short. Think of the upper band as resistance and the lower band potential support when first hit. The last part of the puzzle is momentum. I use the Slow Stochastic Indicator to measure that. This indicator has converted itself into an embedded status. An embedded status occurs when both lines that make up the Slow Stochastic Study go sideways under 20 for several days or more. This reading is in place and will stay that way until the K” line, the red line closes back over a 20 reading. Given that this setup just took place, there could be a lot more declines in store for gold prices. Subscribers to my Market Research received a trade recommendation last night to go short April Gold at 1163.1, which was filled today. I also told my subscribers to cover half of their shorts, which was done near 1154. This now provides them with some cover as they have profits banked to cushion market action. Obviously a tricky part of this trade concerns what to do this coming Wednesday. Big reports, which this coming FOMC Meeting is, are hard to trade as the Fed decision could be one of changing US interest rate policy. Algorithm traders will take control of the gold market as news of what the Fed does or doesn’t do in terms of leaving in the word “patient” in or removing it will be what they initially focus on. If the Fed removes the word “patient”, expect interest rates to move higher in anticipation of a June interest rate increase. 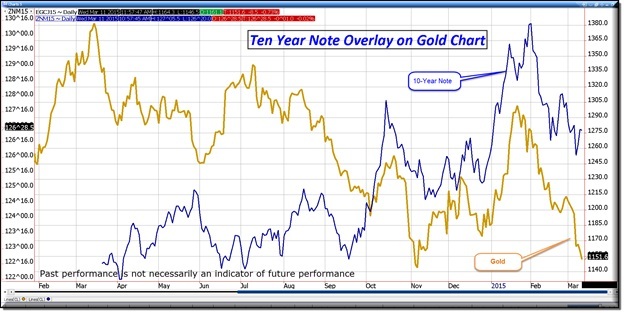 Assuming the relationship holds between the 10-Year Notes and Gold, gold prices will likely drop on that scenario. If the word “patient” is left in, gold will likely get a bid as interest rates would likely move lower in disappointment. Those who’d positioned themselves for a rate increase by selling 10-Year Notes Futures will most likely trim back or get out of those positions by buying the 10-Year Note Futures, which will drive them higher and possibly take gold along with it. I want to leave you with flexibility at this point, given there are 5-trading sessions left including today before the FOMC Announcement. It matters little what my personal thoughts are on what the Fed should do, but assuming you’re interested, I am in the camp that thinks the Fed should leave the word “patient” in, as I don’t see inflation pressures in wages or goods at this time and the Fed says its data driven. There’s no inflation data to raise off of. Central Bankers around the world are in a race to break their currencies relative to the Dollar and other currencies, in hopes of making their goods market competitive and to stimulate their economies. South Korea and Thailand joined the party this week. Does this mean I am friendly gold since I think the word “patient” should be left in? No, I think gold ultimately breaks lower no matter what. It’s from what level and what causes it more than anything else as I see it. I provide a Free 10-Day Trial to my Market Research. You might know someone who might be interested in seeing or you might be interested yourself. Feel free to pass this report on. You can contact us for a Free 10-Day Trial buy calling us at 1-866 973 2077 or simply click here and fill out the form. Disclaimer: This publication is strictly the opinion of its writer and is intended solely for informative purposes and is not to be construed, under any circumstances, by implication or otherwise, as an offer to sell or a solicitation to buy or trade in any commodities or securities herein named. Information is taken from sources believed to be reliable, but is in no way guaranteed. Chart data is courtesy of LGP-IraCharts. No guarantee of any kind is implied or possible where projections of future conditions are attempted. Futures and Options on Futures trading involve risk. In no event should the content of this market letter be construed as an express or implied promise, guarantee or implication by or from The Ira Epstein Division of The Linn Group, Inc. or The Linn Group, Inc. that you will profit or that losses can or will be limited in any manner whatsoever. No such promises, guarantees or implications are given. Past results are not indicative of future performance.